BARI, 14th SET - "We Italians can really help to create a permanent state of peace in the Horn of Africa and we must do it in our interest. We have to mobilize Europe and China in a big deal because they both have an interest and, acting alone, are likely to provoke social and political tensions ". 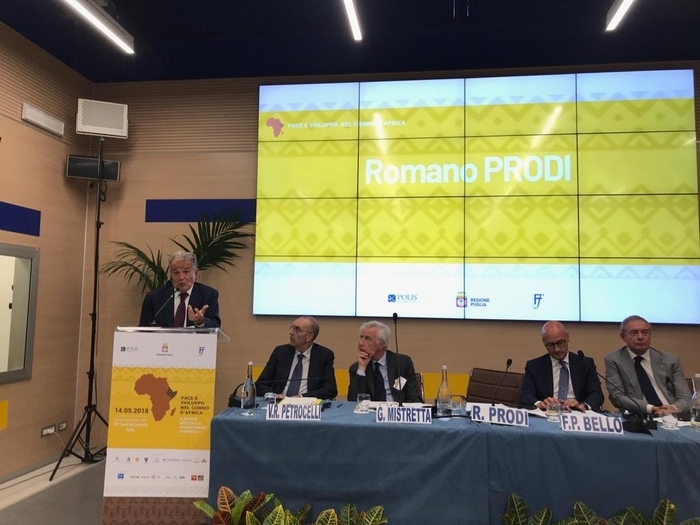 This was stated by Romano Prodi, former president of the Council of Ministers and the European Commission, participating in the International Meeting on " Peace and Development in the Horn of Africa ", organized by Polis Avvocati and the Puglia Region at the Fiera del Levante in Bari. "The Horn of Africa is an extremely varied reality, - said Prodi - with the three countries, Ethiopia, Somalia, Eritrea, all with very close relations with Italy, economic, political and even affection. A special relationship that if we do not rebuild again, time runs out ". For Prodi, however, "there can be no African development with public aid alone. The productive structure must be made by awakening the entrepreneurs ".